The LubISS network offers a unique training platform for Early Stage Researchers in a multidisciplinary research endeavour of great technological, industrial and environmental importance. Research will be done in a coordinated effort among 9 academic institutions and industrial partners from 6 European countries. management, communication and mentorship skills required to become future leaders in academics or industry. (v) Overarching workshops on soft, technical and methodical training. The ITSP includes details of the individual project, the scientific training program (schools, workshops) over-arching workshops on soft, technical and methodical training, outreach-activities and the secondments. Each ESR will be given guidance on planning and realizing his/her own research projects. Close collaboration with other ESRs and students at the host institute will improve the problem solving strategies of ESRs, widen their knowledge on complementary techniques and approaches and strengthen their ability to work within interdisciplinary teams. The ESRs will also be trained in tutoring younger researchers (e.g. Bachelor or Master students) at their host institution. The ESRs will be given the opportunity to attend training courses regularly provided at their host institutions, as well as language courses. The secondments will provide a unique possibility to train the ESRs in complementary techniques that are not available at their host institute. This broad exposure to both academy and industry will be valuable to their training and maximize their employment prospects. 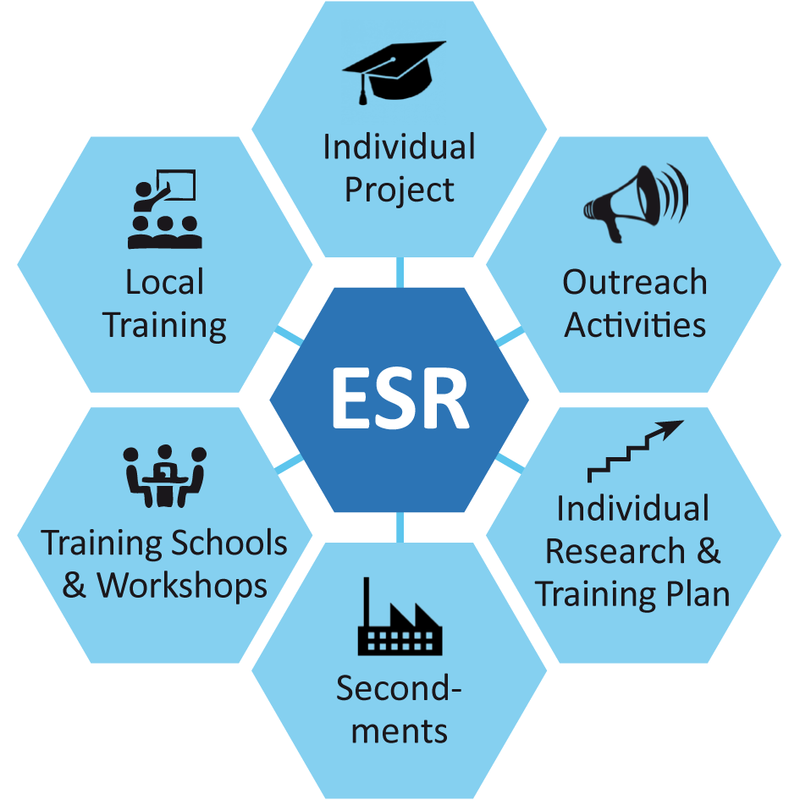 ESRs appointed by an industrial organization will spend at least six months at an academic institution. ESRs appointed by the academic beneficiaries will spend three month at an industrial participant and three months at the institution of an academic beneficiary. The network-wide training events will ensure on the one hand a structured and balanced training within LubISS and on the other hand stimulate the networking between the different host institutions. We aim to organize five progress meetings, four workshops, three schools and one international conference. All meetings and workshops are designed to foster collaboration of the participating organizations. The basic concepts to model wetting of smooth and rough surfaces will be introduced, including advancing, receding and tilting angles, as well as lateral adhesion forces. The consequences of a lubricating film will be discussed, including the Neumann equations, spreading coefficient, capillary forces and elastic forces. The ESR will also be trained on sophisticated chemical methods to fabricate solid, elastic and structured surfaces. The ESRs will be given an on-hand introduction on sophisticated characterization techniques, including laser scanning confocal microscopy, interference microscopy, high speed video microscopy, scanning electron microscopy, methods to quantify (lateral) adhesion, IR,- UV/Vis spectroscopy, X-ray photon spectroscopy and tensiometry. We will not only deal with the correlation of the physical and chemical properties of the surface but also with the static and dynamics properties of liquids on the surfaces. The flow of liquid over surfaces will also be discussed. This school will focus on advanced understanding of adhesion. Different mechanisms of adhesion will be introduced (Van der Waals, electrostatic, and hydrophobic interactions, as well as the interaction of capillarity and elasticity. Analytical and numerical methods to describe adhesion will be presented, including force field methods, molecular dynamics, and density functional theory, mesoscopic (lattice Boltzmann, dissipative particle dynamics) and macroscopic (lubrication theory) techniques. The overarching training workshops will be held by specialists. This training aims to provide communication, presentation and writing skills. Furthermore, special training will be provided on how to write a scientific paper, including structuring the manuscript and design of figures. This will be complemented with training in writing proposals, reports and press releases. This training will focus on evaluation, organization and time management skills. The importance of teamwork and networking will also be discussed. The ESRs will assess their professional experience and expertise. They will align their career goals with current business and employment opportunities. Entrepreneurship and intellectual risk-taking skills will be addressed. This workshop aims to provide knowledge on the regulations affecting filing and licensing of patents, especially in regard to globalization.